People normally want their wedding to be unique and memorable, and all the guests to be having lots of fun. However, it can be hard to come up with the perfect location for the event. There are literally countless possibilities and your choice depends on a number of factors, such as budget, time of the year and number of guests you plan to invite. In this post, we will give you some ideas for unique wedding venues. However, you should let your personal taste and style be your guide. Wedding at a winery. Actually, wineries are becoming popular wedding venues. Probably, it’s their charming, wine history and tradition that make for a lively, post-wedding conversation. Besides, you can’t deny that the view is breathtaking. The best thing is that wineries are popping up in lots of locations across the country and the world, so you don’t have to rule out this option simply because you don’t live in the Napa valley or somewhere in France or Italy. Wineries really do make for unique wedding venues, so maybe it’s time to make some arrangements at your winery of choice well in advance. Wedding at a museum. If you’re looking for picturesque and unique wedding venues for your most memorable day, don’t forget to check out the cultural buildings in your area. You might find that some venues offer truly impressive features that create great photo opportunities, such as ornate entrances or stained-glass windows. Besides, some of these buildings may offer great rental discounts. The marble or stone interiors of some museums provide excellent background for you wedding decoration. Wedding on a train. 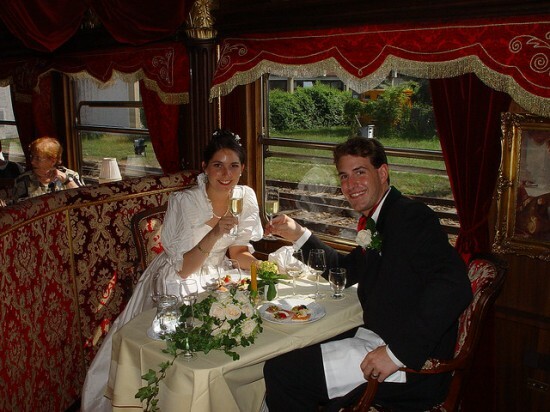 Considering unique wedding venues, we can’t fail to mention train weddings. This is something, which can make you feel almost like you’re stepping back in time. Getting a feel of that slow-paced era sounds really romantic. If you choose this option, you can pick a train to board and start your truly unforgettable wedding adventure. Finding the perfect venue for your wedding ceremony and reception takes a lot of time and careful planning. However, if you want your special day to be creative, memorable and one-of-a-kind, you might consider some unique wedding venues. We’d love to read your ideas in the comments section below the post.